In amphibians, unlike in mammals, there are striking correlations among the size of the animals’ genomes (an organism’s complete set of genes) and several aspects of the animals’ size. For example, amphibians with large genomes tend to be bigger than those with smaller genomes. Larger genomes also correspond to larger cells and larger organelles (specialized cellular structures such as the nucleus). Heald has also demonstrated that these seemingly fixed parameters can be tweaked in the lab. Way before dreaming up ways to design the frogs of people’s nightmares in her lab, Heald was fond of science. She remembers cutting her teeth on more mundane experiments in middle and high school, such as distilling gases from burning wood, dissecting fly embryo salivary glands (which she thought was “really cool because you get to use your fine motor skills,”) and examining microorganisms under a microscope. 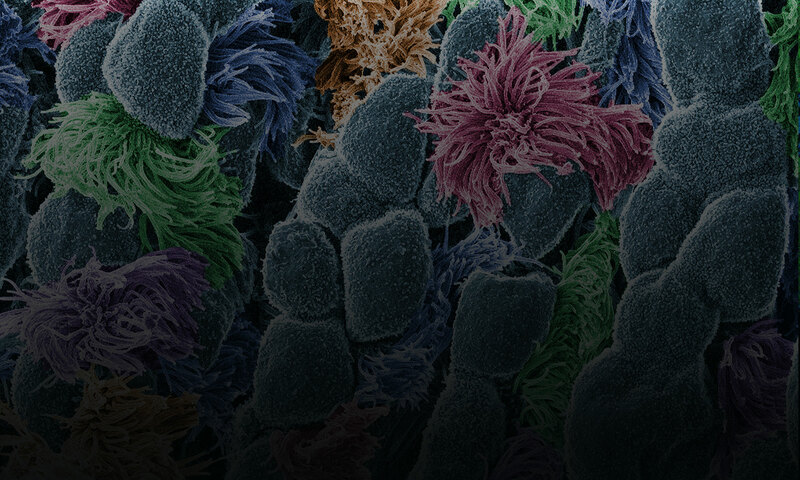 “I definitely thought microscopy was just this whole new world, a whole new way of seeing things,” she recalls. Even earlier than these formative experiences, Heald found herself attracted to life as a scientist for other, more ethereal reasons. She would often accompany her chemistry professor father to his lab at Thiel College, a small liberal arts school in northwestern Pennsylvania, where she recalls enjoying the ambiance. She was even more impressed by living with her parents in Australia and New Zealand during their sabbaticals. 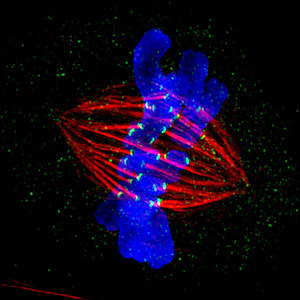 The spindle, composed of thousands of microtubules (red), grabs hold of chromosomes (blue), which replicate during cell division. As the cell divides, the spindles will separate the paired chromosomes so that each daughter cell will contain a complete set of chromosomes. Credit: Jane Stout and Claire Walczak, Indiana University. “I think those experiences had a big influence on my interest in the academic lifestyle, that you could go live other places, and work with interesting people,” says Heald. After completing a Ph.D. at Harvard Medical School, Heald arranged her own international excursion by working as a researcher for 3 years in Germany. “It was exciting to see how a different culture does science,” she recalls. During her time in Germany, Heald studied the football-shaped cellular structure called the spindle, which is composed of thousands of thin fibers called microtubules. During cell division, chromosomes replicate, yielding two copies of each chromosome connected together like conjoined twins. Spindle fibers attach to the chromosomes, pull apart the twins and move the previously paired chromosome to opposite ends of the cell. The goal of the whole process is for each daughter cell to contain a single copy of each chromosome—a complete genome. Heald discovered that spindles can form in the absence of proper chromosomes. Instead they coalesce around DNA-coated beads through a process of “self-organization.” This finding earned her a faculty position at Berkeley, where she set out to compile the minimum parts list necessary to make a functional spindle. Because spindles are so complex—made of microtubules along with about a thousand other proteins and other various components—Heald estimates it could take more than a decade to tease out which are the critical factors that, when combined, would be sufficient to reconstitute the spindle. 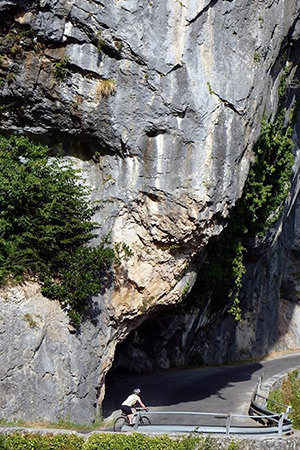 Rebecca Heald rides through the Pyrenees mountain range in southern France. Credit: Steve Hill. 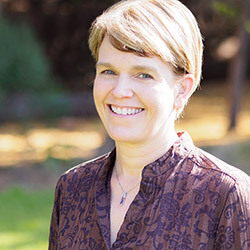 When it came time for her first sabbatical a few years after landing her job in Berkeley, Heald again looked abroad, spending a year doing research in Toulouse, France. An avid cyclist, she took advantage of down times in the lab by racing through the Alps and Pyrenees mountain ranges. At home in Berkeley, Heald enjoys cycling down by the San Francisco Bay and powering up the Berkeley Hills to the east. For the past 10 years or so, she has completed what she calls “Triathlon Thursdays.” These early-morning blitzes begin at 7:00 a.m. Instead of the traditional bike, swim and run, Heald meets up with a friend or colleague for a long bike ride. She then comes home and sinks into a bath. She wraps up by taking her dog, Louis, for a walk. Heald first fell in love with frog eggs as a research system during her early studies of cell division. She was fascinated that spindle formation requires neither proper chromosomes nor intact cells. All it needs is isolated cytoplasm—the gel-like substance in which a cell’s organelles are embedded—and some DNA, either in the form of chromosomes or DNA-coated beads. To figure out which molecules are necessary for spindle assembly, Heald uses a cytoplasm extract, which contains all the components necessary to build a cell, but lacks chromosomes. To obtain this extract, she and her colleagues collect thousands of eggs from the African frog Xenopus laevis. They then remove the eggs’ jelly-like outer coating and put them in a centrifuge tube. Spinning the eggs in a centrifuge crushes them and separates the egg contents so that the cytoplasm can be isolated. The scientists then add chromosomes (usually from frog sperm) to the extract, together with fluorescent tags attached to various spindle proteins, and use microscopes to observe the spindle form. By manipulating the proteins in the egg extract mixture, and substituting different kinds of DNA-coated beads for the chromosomes, Heald learns which factors are needed for spindle assembly. She uses this information to support her long term goal of building a spindle from a defined set of parts. While her research into spindles was progressing, a colleague at Berkeley introduced Heald to a related frog, Xenopus tropicalis, that was smaller than the one she had been working with, and also has a smaller genome. Heald was enthralled with the fact that not only was the body of this new frog smaller (X. tropicalis is the size of a kiwifruit whereas X. laevis is the size of an orange), but so were its eggs, as well as the spindles formed in its egg extracts! 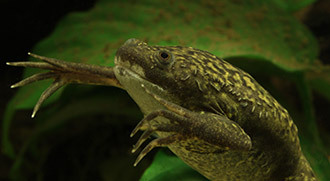 Xenopus laevis. Credit: Wikimedia Commons, H. Krisp. This was exciting because it provided an experimental system to investigate how spindle size is determined. The Heald lab learned that they could mix together the cytoplasm from the eggs of the two frogs and add in chromosomes, and the result would be hybrid spindles of intermediate size. This result suggested that there is something in the cytoplasm that is determining spindle size. Heald’s group is now seeking to identify the factors—they call them scaling factors—that work to regulate the size of the spindle. Subsequent experiments in her lab revealed that spindle size is controlled in two ways: one that depends on the amount of certain proteins, and the other that depends on the specific sequences of those proteins. For example, an enzyme that cuts microtubules, called Katanin, has a slightly different amino acid sequence in the two frog species, and the result is that in X. tropicalis, Katanin is much more active at chopping microtubules, which makes the spindle smaller. Even though, as Heald puts it, “mammals are actually quite boring; all of our genomes and cell-size relationships are pretty much the same,” her work has important implications for humans. Under certain circumstances, human cells, and the organelles within them, vary in size. For example, cancer cells are characterized by enlarged and misshapen nuclei. Researchers do not know whether these cellular aberrations are a cause, or a result, of disease. Cancer messes up cells in a number of other ways. For example, many of the thousands of factors that affect spindle assembly are altered in cancer cells, and it is not clear how these changes impact the spindle. Cancer cells also tend to be unreliable when it comes to accurately divvying up chromosomes during cell division, resulting in daughter cells that have too many or too few chromosomes. Heald plans to study this phenomenon using the frog Xenopus longipes, whose genome of 108 chromosomes is significantly larger than that of the other frog species (X. laevis has 18 chromosomes and X. tropicalis has 10). An important question for Heald is how these animals properly segregate such a massive number of chromosomes to two daughter cells. Heald hopes her research can answer these questions and provide leads on potential cancer therapies and diagnostics. Heald’s research is funded by NIH under grants R01GM057839, R01GM098766 and R35GM118183.